4-in-1 seat grows with your child, so you can enjoy 10 years of use, from 4-120 lbs. The Extend2Fitï¿½ 4-position extension panel provides 5" additional leg room. The headrest and harness adjust together, and the one-hand, 10-position adjustable headrest easily adapts for your growing child. The 6-position recline keeps your child comfortable, while the InRightï¿½ LATCH system with one-second attachment makes installation easy. Graco® 4Ever® Extend2Fit® Platinum 4-in-1 Car Seat gives you 10 years with one car seat featuring EZ Tight™ LATCH, for an secure and simple installation in 3 easy steps. 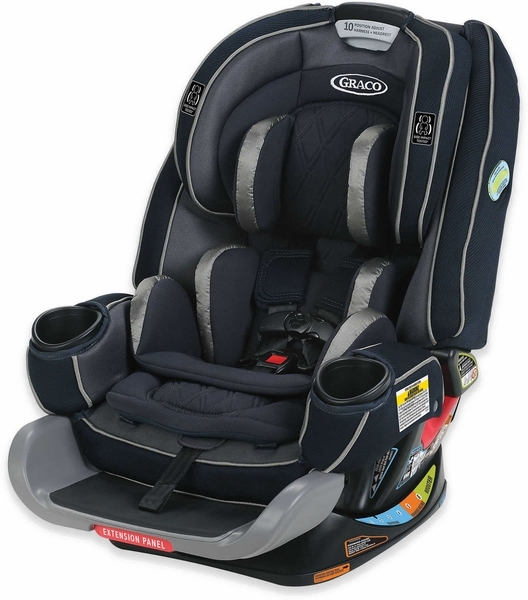 It’s comfortable for your child and convenient for you as it transitions from rear-facing infant car seat (4–50 lb) to forward-facing 5-point harness seat (22–65 lb) to highback belt-positioning booster (40–100 lb) to backless belt-positioning booster (40–120 lb). With the addition of the 4-position extension panel, 4Ever® Extend2Fit® Platinum provides 5” of extra legroom allowing your child to safely ride rear-facing longer. For a proper fit, the Simply Safe Adjust™ Harness System and 10-position headrest lets you adjust the harness and headrest together, with no rethreading. The 6-position recline keeps your child comfortable, while the EZ Tight™ LATCH system with one-second attachment makes installation easy. It’s the only seat that truly goes from baby to booster! In addition to meeting or exceeding all applicable US safety standards, the Graco® 4Ever® Extend2Fit® Platinum has been side impact tested for occupant retention solely with the built-in 5-point harness system and belt positioning modes.